Bad News, Men: You're Not Very Charming A new piece in The Atlantic argues that American men lack charm, both in the movies and in real life. 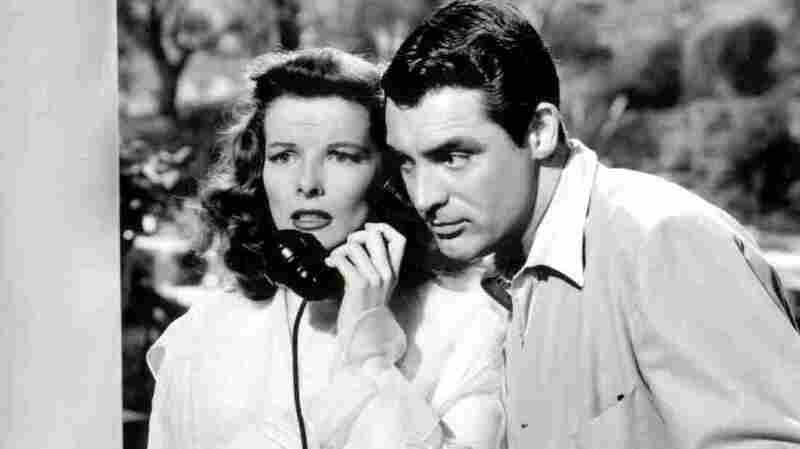 Katharine Hepburn and Cary Grant in The Philadelphia Story, in which Cary Grant is very charming. I hate to break this to you, Men Of The Entire United States (Especially Actors), but The Atlantic has just run a lengthy piece pronouncing you un-charming. Women commonly complain about the difficulty in gaining any conversational purchase when, say, trying to engage the fathers of their children's classmates or the husbands of their tennis partners. The woman will grab from her bag of conversational gambits—she'll allude to some quotidian absurdity or try to form a mock alliance in defiance of some teacher's or soccer coach's irksome requirement. But the man doesn't enter into the give-and-take. The next time they meet, it's as though they've never talked before; the man invariably fails to pick up the ball, and any reference the woman might make to a prior remark or observation falls to the ground. Men don't indulge in the easy shared confidences and nonsexual flirtations that lubricate social exchange among women. Even in the most casual conversation, men are too often self-absorbed or mono-focused or—more commonly—guarded, distracted, and disengaged to an almost Aspergerian degree. So basically he just ... doesn't like you. Not only doesn't he like you, but he doesn't like you on my behalf, because I and my kind are constantly trying to get you to have a decent conversation, and you're self-absorbed and guarded and not paying attention, and maybe you're all kind of almost on the autism spectrum (!). Why, if I had a nickel for every time I called up one of my girlfriends on my Princess phone and said, "There I was, alluding to a perfectly good quotidian absurdity, and he wasn't lubricating our exchange at all!" Well, if I did, I would have enough nickels for another Princess phone, that's what. In fairness, this might be only men who have school-aged children or wives who play tennis, because this is (according to this explanation) the kind of way that women meet you men in non-romantic settings. This can only be the direct result of the coming abolition of work outside the home, which I am super-glad to hear about, because ugh, I'm tired of having a job where all day long, I meet men who aren't my friend's husbands or my children's fathers. Bo-ring. But there are lots of other reasons it is reportedly clear that you have no charm, O American Men: you like sports ("the seriousness with which American men take sports both confirms and exacerbates their suspicion of charm"), you fail to look good in tuxes even in my imagination, and you eternally fall short in the area (mastered by Cary Grant in the movies) of making me and other women appear "simultaneously regal and hilarious" when we converse. It's funny, because I was wondering why I didn't feel regal and hilarious, and for a while, I thought it was my tendency to spill coffee on myself, but now I know it was that you lack charm. Tsk. Honestly. You see, there used to be actors who had charm, Schwarz said, including Cary Grant (duh-doy!) and especially James Garner, who seems to be the real definition of charm in Schwarz's eyes. He is described as a "hardscrabble Oklahoman, [who] is at once worldly and untainted by sophistication." I've been meaning to tell all of you to stop being so tainted with sophistication, by the way, so I'm glad someone brought it up. But in the end, it turns out that charm is very, very dangerous. (Twist ending, kind of!) "The charming man (or woman)," says Schwarz, taking a momentary interest in the charm of women, who up until now only appeared in our story as conversationally frustrated tennis players, "always knows that he (or she) is pulling something off, no matter whether that charm is used to put the wallflower at ease, to get the soccer dad to exchange some pleasantries, or to close the sale. The charmer knows that he or she is manipulating—and in the end, it's impossible not to be at least slightly contemptuous of the object of one's manipulation." So it turns out that charm is not necessarily a good thing; it is, as he says, "amoral." But it's good in movie stars, who once had it to spare, unlike the meathead clowns floating through the films of today. Said meathead clowns are incapable of embracing the definition of charm, even though it is broad enough (in Schwarz's eyes) to encompass Grant, Clark Gable, William Powell and Fred MacMurray — not one but four white men wearing suits and fedoras born in a 16-year period beginning in 1892! The message: be more charming, movie actors! And continue being suspicious of charm, other American men! And try to be better conversationalists, and maybe comb your hair, and stop rejecting my attempts to engage you with everything in my bag of conversational gambits! Frankly, I'm exhausted.